For Gov. Andrew M. Cuomo, the political damage, it seems, is already done. Over the last six weeks, federal prosecutors in Manhattan unspooled a streaming spectacle of unflattering tales of how Mr. Cuomo, 60, conducts himself and how his administration has conducted the people’s business in Albany. Witnesses and court records told stories of the governor’s pitching a screaming fit after an upstate development deal fell through; allowing Joseph Percoco, a former top aide and confidant who is one of four defendants on trial, to continue to use a state office and phone while he served as his campaign manager in 2014; being cajoled into talking cars, for a half-hour, with an executive of a company now accused of trying to bribe Mr. Percoco to do their bidding. State election laws were ignored or flouted, critics say, and campaign finance rules exploited to allow Mr. Cuomo’s donors to use multiple, anonymous companies to give amply to his coffers, a practice urged on by a longtime Cuomo associate. The governor has not been accused of illegal acts, and prosecutors and the federal judge in charge of the case, Judge Valerie E. Caproni, have stressed that the donations in question were legal. . Nonetheless, the corruption trial, which enters its fourth day of jury deliberations on Tuesday, may well tarnish the well-groomed reputation of Mr. Cuomo, a second-term Democrat facing re-election in the fall. It may also complicate or undercut any national ambitions, which would need to take flight in places like Iowa and New Hampshire next year. Other major Albany corruption trials will soon follow, including those of Sheldon Silver, a Democrat who was the longtime Assembly speaker, and Dean G. Skelos, a Republican who was the Senate majority leader. Both men are being retried after their convictions were overturned on appeal last year. In June, another former Cuomo ally, Alain E. Kaloyeros, the former president of the State University’s Polytechnic Institute, is to go on trial in yet another corruption case. The trial of Mr. Kaloyeros, who the governor once said was “as close as I’ve ever come to dealing with a genius,” involves bid-rigging in Mr. Cuomo’s signature upstate economic plan, the Buffalo Billion. There are some indications that the Percoco trial has hurt Mr. Cuomo’s popularity. A Quinnipiac University poll in mid-February found him with an approval rating of 47 percent. A whopping 63 percent said Mr. Cuomo should not run for president, including almost half the respondents from his own party. Mr. Cuomo has scrupulously avoided talking about the trial, saying he respects the legal process. He has held noticeably few public events in recent weeks, and has mostly avoided unscripted questions from the press. 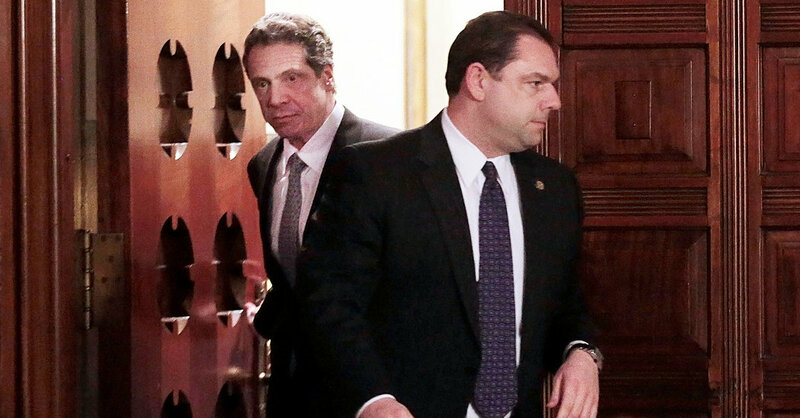 Democratic strategists said the corruption case was all but assured to be part of Mr. Cuomo’s national introduction, should he run for president, especially if Mr. Percoco were to be found guilty. Those looking to paint Mr. Cuomo as being ethically challenged have the benefit of an indelible catchword from the trial: “ziti,” the much-used code word that the prosecution contends Mr. Percoco and his fellow conspirator used to describe the under-the-table payments he received while serving as Mr. Cuomo’s campaign manager and senior aide. Here in New York, even before the jury returns its verdict, a collection of government watchdog groups have issued a scathing assessment of what-we-learned-at-trial, calling out “stunning failures in New York’s ethics oversight system” under Governor Cuomo. The groups also demanded answers to a series of questions raised by the trial, including why “so many high ranking officials were allowed to conduct business through personal emails,” something illustrated, again and again, during testimony. Indeed, the trial reinforced the Capitol’s shoddy reputation for ethics, something Mr. Cuomo promised to fix when he first ran for governor in 2010. Even then, however, the governor seemed willing to take advantage of donor’s generosity: testimony at trial showed that Mr. Cuomo, in the closing days of that campaign, used a private plane from a company, Competitive Power Ventures, r later accused of bribing Mr. Percoco. An executive with another company involved in the scandal, COR Development, a Syracuse-area developer, wooed Mr. Cuomo with talk of Corvettes at a fund-raiser for him, knowing his affinity for those sports cars. The Percoco trial also shed light on the use of sometimes shadowy limited liability companies to flood money into state campaigns, including those of Mr. Cuomo, who has been a major beneficiary of the so-called “L.L.C. loophole.” In one instance, the government’s star witness, Todd R. Howe, showed how COR, a company with business before the state, purposefully split contributions — and used nondescript names on the L.L.C.s — to hide their origin. While those activities were legal, the disclosures have been met with glee by the governor’s opponents, in particular the beleaguered state Republican Party. The chairman of the state Republican Party, Edward F. Cox, has asked a state ethics panel to investigate Mr. Cuomo, saying the governor has violated New York Public Officers Law, and has requested the Manhattan district attorney, Cyrus R. Vance Jr., to also investigate. Mr. Cox, whose party has not won a statewide election in New York since 2002, saw parallels between Mr. Cuomo’s guilt-by-association and that of former Gov. Chris Christie of New Jersey, whose proximity to the bridge-closing scandal known as Bridgegate helped dent his national profile. “This is the end of Governor Cuomo’s political future,” Mr. Cox said at a news conference last month before the steps of Federal District Court in Manhattan, where Mr. Percoco is being tried. That may be an overstatement; unlike Mr. Christie, whose former aides implicated him at trial for knowing of the decision to close bridge lanes, Mr. Cuomo has not been similarly besmirched. And officials with the state Democratic party, controlled by Mr. Cuomo, shot back at any suggestion that the governor would be hurt by the Percoco trial. Indeed, with $30 million in the bank and no top-tier opponent in the contest, Mr. Cuomo remains a heavy favorite to win re-election this year. Among Democrats, no serious primary challenger has yet emerged, though two women, the former Syracuse mayor, Stephanie Miner, and the actress Cynthia Nixon, have publicly toyed with running. But if his ambitions extend to the White House in 2020 — and Mr. Cuomo has increasingly framed his agenda in national terms — the trial, especially if it ends in a conviction, threatens to muddy his core argument that he can be a capable and trusted custodian of the state, or especially, the country. Vivian Wang contributed reporting from New York.